BOSTON — It isn’t the grand, sweeping gestures that make for great actors and actresses. It is the nuanced gesture, a word accented or an inflection, or the reaction to a word or piece of dialogue. 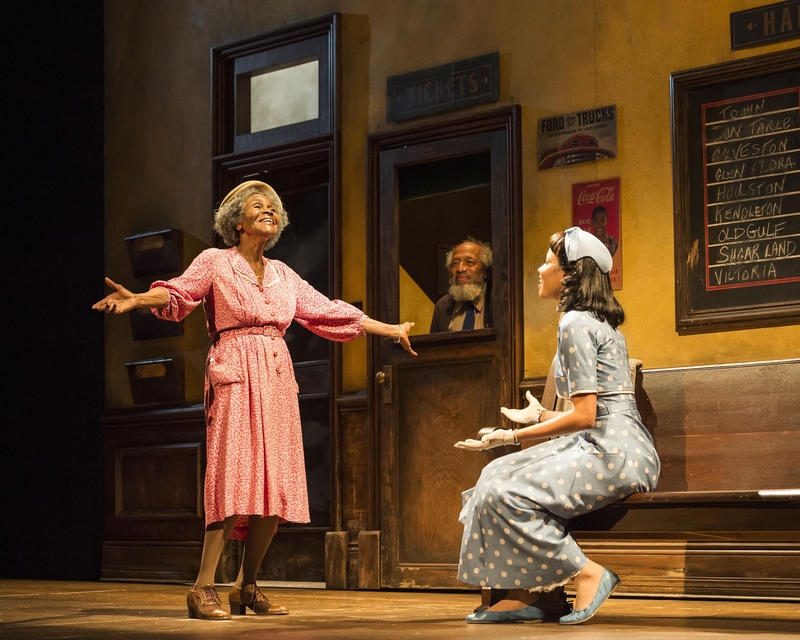 That’s how to put into context Cicely Tyson’s performance in the national touring production of Horton Foote‘s “The Trip to Bountiful,” being presented by ArtsEmerson at the Cutler Majestic Theatre through Dec. 7. 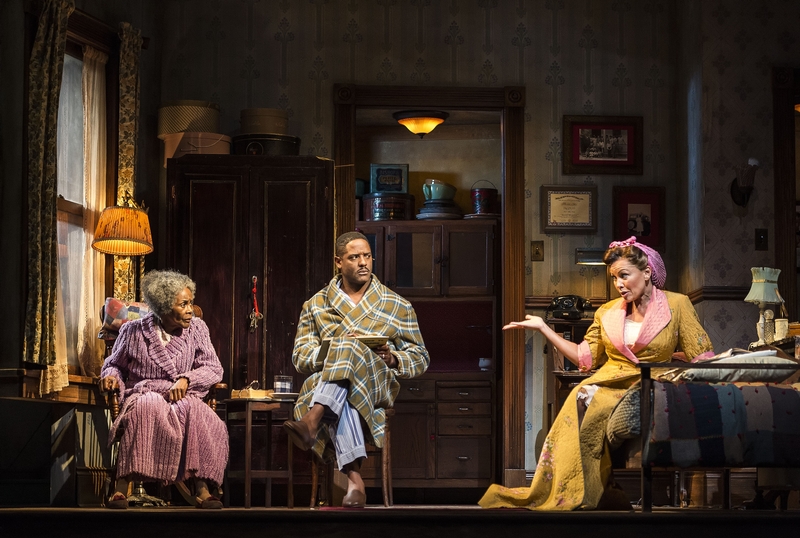 There are laughs — in many cases, big laughs — where I don’t recall them being before in this lovingly performed, pitch-perfect recreation of the 2013 Tony Award-winning production, with Tony winner Tyson and Vanessa Williams and reprising their Broadway roles and Blair Underwood joining the cast. There is disagreement about Tyson’s actual age, with some sources claiming she was born in 1924 and the vast majority in 1933 — her birthday is in December — but no matter which is true, calling the octogenarian actress portraying Cassie Watts spry would be a severe understatement. Her character dances, sings gospel songs, schemes, pleads, cajoles, and charms, all at the same time. It would all go for naught if the other leading actors were not up to the task in the story of a woman yearning to revisit, after a 20-year absence, her hometown of Bountiful, Texas once more before she dies. Did E.T. want to go home? Carrie Watts does, and she’s a woman on a mission. Blair Underwood is right there with her as her well-meant, long-suffering son Ludie, doing his best in balancing the needs of his wife and mother even as he struggles to find his footing at his new job. The luminous Vanessa Williams is Jessie Mae Watts, Ludie’s wife, whose sparring with Cassie provides comic highlight after comic highlight. Jessie Mae probably would be best described as would be “high maintenance.” She doesn’t work, but is still loathe to give up her weekly trip to the beauty parlor, even while Ludie was sick and out of work for two years. But then again she probably didn’t sign up for 15 years with the widowed “Mother Watts” aboard for the ride in a cramped, two-room 1953 Houston apartment where there is no refuge from each other. So Cassie lives her life on a day bed, her pension check having allowed the family to stay afloat, although they can’t afford a car and financial woes are always bubbling just underneath the surface. Ludie and Jessie Mae are childless, which will also be a point of contention. Cassie is restless, having already once flown the coop and attempted to visit her childhood friend in Bountiful, the small country home where she grew up poor but happy. “Bountiful” benefits from a warm, winning, heartfelt performance by Jurnee Smnollett-Bell as Thelma, the young woman who befriends Cassie at the bus station and provides a willing traveling companion. Thelma allows just why and why it is so important that she has a loving marriage, and Cassie admits to Thelma she never loved her husband. “There are worse things,” Carrie replies wistfully, envying her friend her space, even in death. Michael Wilson’s direction is strong and sure and the production values are first-rate, especially placed alongside other national tours that sometimes skimp from the Broadway production. The scenic design by Jeff Cowie includes the well-detailed apartment, the tired bus station, the bus ride itself and, finally, evokes the faded beauty of Bountiful at dawn. John Gromada’s original music and sound design, Van Broughton Ramsey’s period costumes, and Rui Rita’s lighting are all effective. Her task finally accomplished as she tells Ludie “I’ve been to Bountiful,“ you may find tears rolling down your cheeks as Cassie surveys her decrepit family home in Bountiful for the last time before she heads back to the her little corner of the cramped apartment. But Ludie has gotten the raise he was looking for, and things look brighter and maybe, just maybe, Cassie will die a happy woman. ArtsEmerson and Jonathan Reinis Productioons in association with Center Theatre Group present “The Trip to Bountiful,” by Horton Foote. Directed by Michael Wilson. At the Cutler Majestic Theatre, Tremont Street, through Dec. 7. http://www.artsemerson.org.